As we continue to celebrate the essence of home with one another, we would all like to thank each of you for sharing with us those special moments in your home. 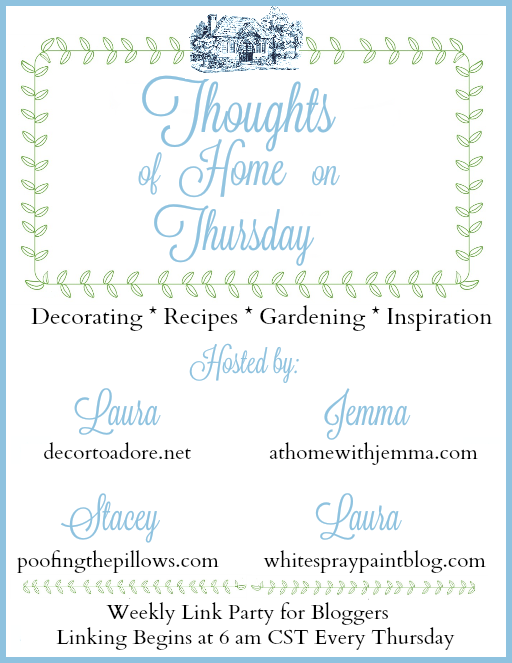 As a thank you for joining us in our launch of Thoughts Of Home On Thursday we have been hosting a giveaway each week. 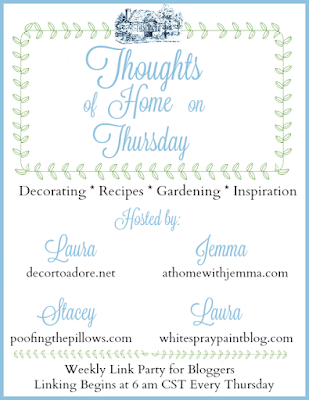 Today is our fourth giveaway hosted by Jemma of At Home With Jemma. botanical note cards, book mark, cake cookbook, Easter decor and more. Winner of this giveaway will be announced next week. Please enjoy the features for this week. We enjoyed how Linda at Itsy Bits and Pieces did a little gardening by "bringing in a little green." Very savvy gardening with some faux succulents. In this weeks features we were inspired by Kitty at Kitty's Kozy Kitchen. Kitty took us on a tour of her sewing room and shared a tutorial on how she used her late beloved's shirts to make aprons. 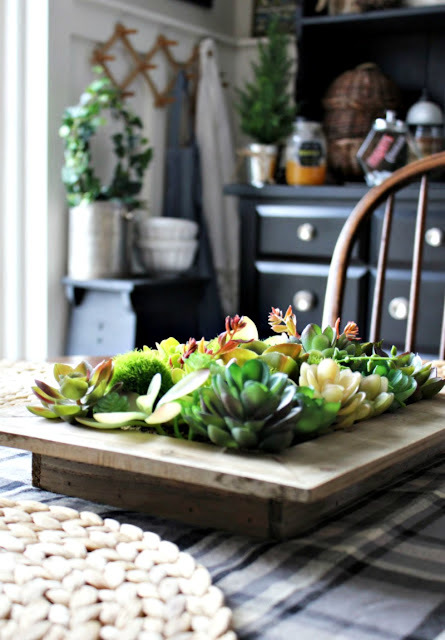 Kari Anne from Thistlewood Farms made us smile as she shared Four Spring Table Decorations. 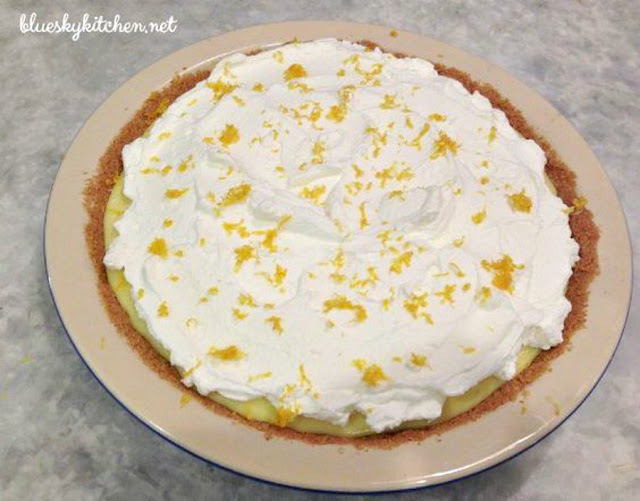 Carol at Blue Sky Kitchen does, grab some from the grocery and make this wonderful pie. Thank you again for joining us, we can't wait to see what you have to share! Thanks so much for hosting, Stacey! Thank you for hosting me also today, I'm here with much joy more and more ( and this time with three posts I hope you and your readers will enjoy) ! Such a fun party each week! 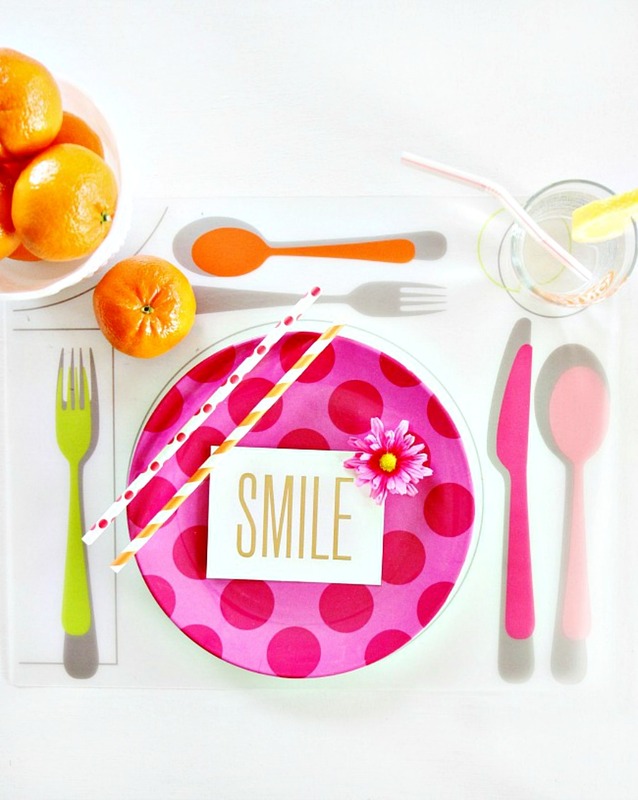 Thanks for hosting and I hope you have a beautiful day! Thanks so much for hosting, Stacey! I look forward to this party every week!!! So much inspiration in these features. Thank you for the linky, Stacey. Good Morning Stacey, lovely features once again and so much inspiration. Thank you for hosting and all you do each week. 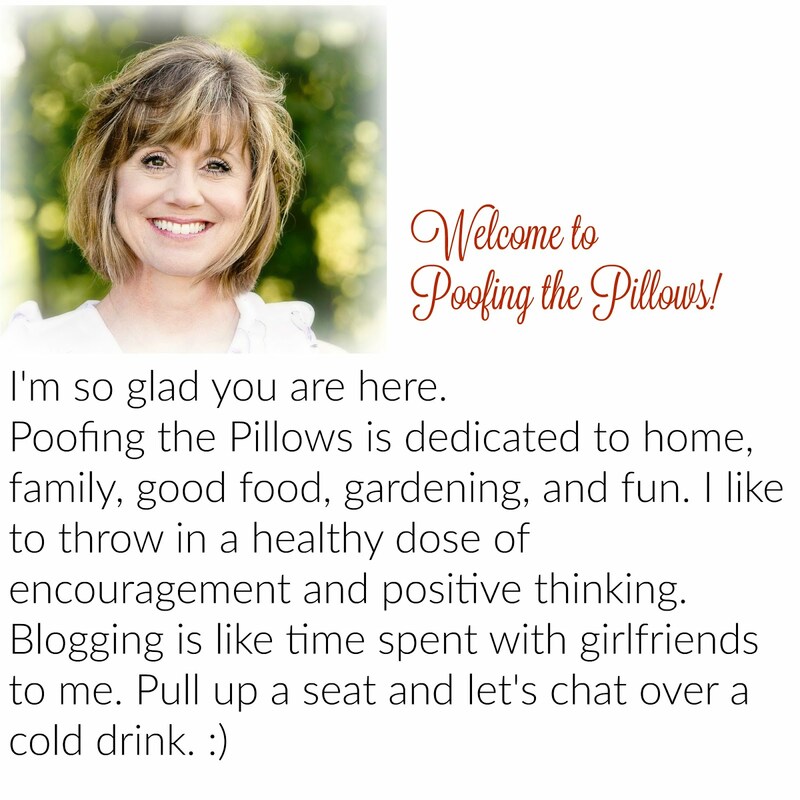 Looking forward to the blog hop too. Good morning Stacey! Such awesome features and I must check out that cute apron! Thanks for hosting and enjoy the rest of your week. Good morning, Stacey! Thank you for the invite, I have joined in this morning and am looking forward to browsing while I have my coffee. Such pretty features! Thanks so much for including mine! Happy TOHOT Stacey! You gals are getting bigger and better every Thursday and I am thrilled for you all! Thanks for being the hostess with the mostest! Stacey, I smile every time I see Kitty in that cute apron. I love the sentiment! Enjoyed all the features. Thanks for hosting! Thanks for hosting , Stacey. This is a really fun party! Love kitty in that cute apron. So enjoying the party Stacey! Love you ladies. Love this series, Stacey. Now I look forward to Thursdays every week! Have a good one. This looks like such a great party, Stacey. I'm going to try to find some time to visit these ladies. I'd love to join up but I can never remember the days of the parties!! I'm busy, too, lately so it's hard to get around visiting. I did read about your dogwood wreath...I'd love to try making one. I am late linking up today, but so happy to be here! Thanks for a wonderful party girls!! Thank you so much for the sweet comment and the generous invite. I'm happy to be joining you tonight, so thanks for hosting. Thanks for the party Stacey. Lovely features. 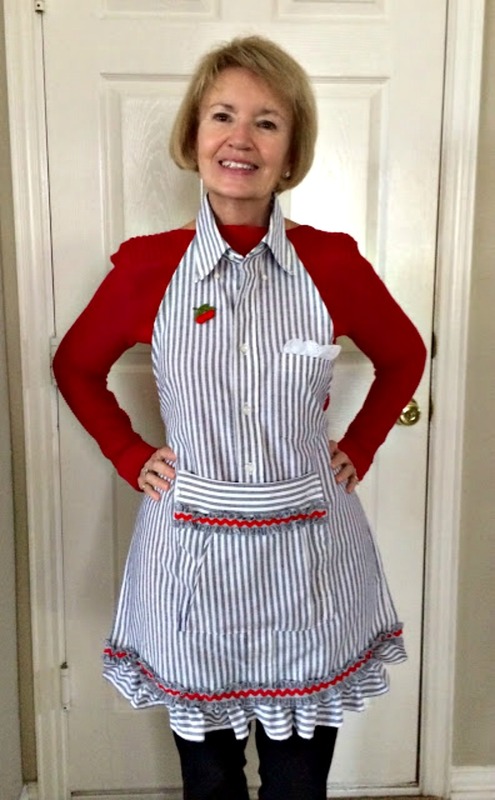 Amazing features from last time - I absolutely love Kitty's idea of repurposing a loved ones shirt into an apron - so special and so cute! Your party is growing by leaps and bounds. How fun. Thanks for hosting. I've been so busy at work that I've missed this party for the past two weeks. Now, I off to read about your Friday feature.